As seen on Drake Business Review (Volume 7, Number 2) Page 26. The more revenue an average employee generates, the more productive and effective your workforce is. Financial websites like MarketWatch include it in their stand- ard financial profile for each firm, making it easy to measure change in your company’s productivity over last year and to quickly compare the productivity of your workforce to that of your top five industry competitors. You calculate this ratio by dividing your company’s total revenue by the number of employees (company revenue/number of employees). It’s best to make comparisons within the same industry, but the top benchmark revenue per employee number to compare yourself is Apple, where the average employee generates an astonishing $2.19 million in revenue every year. As a rule of thumb, in most industries, above-average firms produce revenue per employee that exceeds three times their average employ- 2ee’s salary. At Apple, it exceeds nine times. Metric #1, revenue per employee, has a sig- significant weakness in that it omits the cost of an average employee. The gold standard of efficiency assessment in any business area is ROI, which compares the cost of an item to the value of its output. The profit generated per dollar spent on the employee is your second most valuable snapshot metric. Although it is more complex, this ROI on workforce expenditures is a more accurate measure because it includes the cost of employees rather than just the number of employees, and it substitutes profit for revenue, a better measure of company success. To get this ROI ratio, divide the company’s total profit for the year by the total cost of the workforce, including all salaries, benefits, and HR costs. The higher the ratio of profit generated per dollar spent, the more efficient you are. Dividing Apple’s profit of $37 billion by their 2014 estimated total cost of labour of $16 billion ($200,000 per employee), you get an astounding ROI of 2.3 to 1. At other firms, a ratio of .20 to 1 could be considered a minimum target. Unfortunately, because total labour costs are not publicly available, you cannot easily compare your efficiency with other firms, so focus on year-to-year improvement, which means getting more profit from each labour dollar spent. Effective workforce innovations directly increase corporate revenue, producing up to five times the economic value of merely being productive. So once you’ve determined whether your workforce is productive, effective, and efficient, your next concern should be whether it is innovative. Rather than counting the number of ideas or innovations generated by the workforce, look at the impact of implemented innovations on corporate revenue. After all, you can’t consider an idea effective unless it is implemented and proven to be valuable in the marketplace. After calculating these four strategic indications of talent management’s impacts on the business, you may want to go further to measure the efficiency of every individual talent function, including engagement, leadership, T&D, and compensation. However, avoid falling into that trap, because you can safely assume that great leadership, training, compensation, and performance management will directly lead to the improvement of your workforce productivity and innovation. 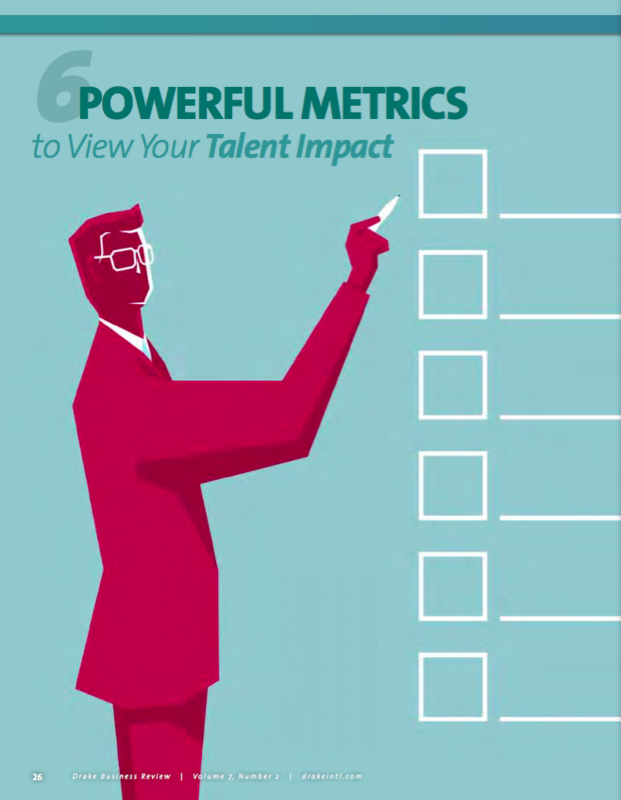 You can go a step further if you restrict your metrics to the highest-impact talent areas. A recent Boston Consulting Group study of 22 different talent functions identified the ones with the highest impact on revenue and profit: Top was recruiting (with the closely related employer branding in fourth place) and second was retention. A related indicator of your employee brand strength is your employee referral rate. The referral percentage out of all hires is important because only employees who like where they work recommend it to their top-performing colleagues. If their morale, satisfaction, and engagement are low, they certainly won’t take the time to refer their most admired colleagues. And so it makes sense to use the percentage of all hires that come from referrals as an indication that your employees like where they work. The benchmark is at least 45% of all hires c6oming from employee referrals. Losing key assets directly to competitors is never a good thing, so a key success measure of great talent management is your firm’s effectiveness in keeping its highest-performing employees, those rated in the top 10% of performers. Listing that turnover percentage is not enough; you must go the next step and quantify the financial impact of this loss if you want to ensure that you get the attention of your executives. Talent management tends to use too many metrics, so try to avoid adding any more to this short business impact list. It is fine to use common tactical metrics, such as time to fill, training hours, and employee engagement scores, but be aware that these are tactical and not strategic impact metrics to use for internal continuous improvement purposes. However, if you train, develop, move employees, and hire effectively, these successes will all improve the business impact measures. No matter what metrics you pick, executives won’t find them credible unless they have been fully vetted by the CFO, the undisputed King of Metrics. Therefore, before you go very far in creating your snapshot assessment, work with the CFO’s office to ensure that they support the metrics you selected and their formulas, the methods for gather- ing the relevant data, and which benchmark number will be used to judge yearly success against. Then run these metrics by a sample of managers and executives to identify their concerns and to be able to answer each one whenever you present your snapshot metrics. After calculating your metrics, if you find that your firm is simply not competitive, ask yourself what the top firms are doing in talent management that you are not.